Help Documents - Version 5 Event Revenue StreamsWhat are possible revenue streams for my event? In addition to your event's ticket sales, there are other opportunities which will increase your event's revenue. The categories below provide common sources of event revenue, including regular event ticket sales. The link in each category provides instructions on how to set up your registration website. Despite the prevalence of event sponsorship in the corporate marketplace is increasing, many organizations have great difficulty in achieving a significant amount of sponsorship. Organizations need to be very professional in their approach to sponsorship and to be able to offer sponsoring companies outstanding value in promotional services. The term merchandising applies to the sale of a range of products that may be strongly identified with the event or the organization hosting the event. A common example of merchandising is the production and sale of souvenirs, such as T-shirts, polo shirts, caps and other forms of clothing that are screen printed or embroidered with a design or trademark of the event. Participants tend to purchase such articles for their commemorative value. Other typical forms of merchandise include glassware, pens, dish cloths, drink bottles and badges. 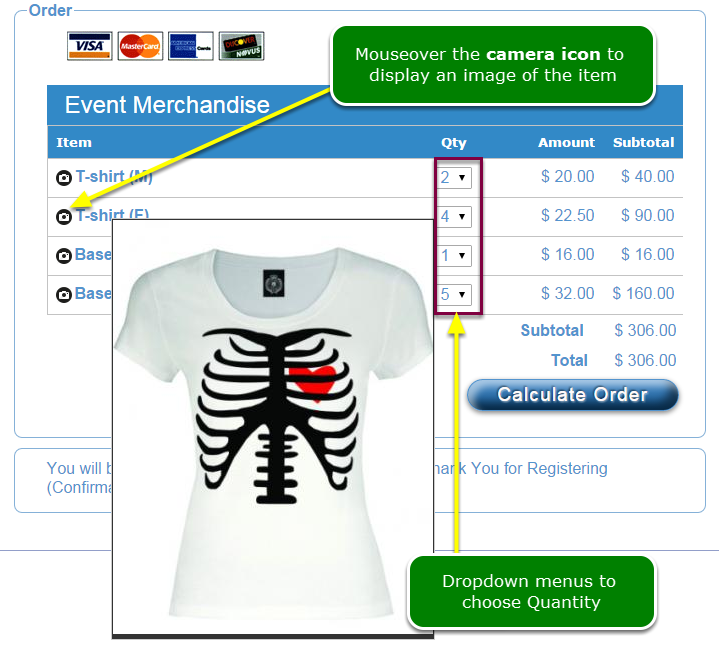 Merchandising may be a form of income suitable for events that have larger numbers of participants. rsvpBOOK provides tools to assist with the sale of souvenir items such as photographs of the items which can be included on the registration page. How do I add pictures to a sales item? 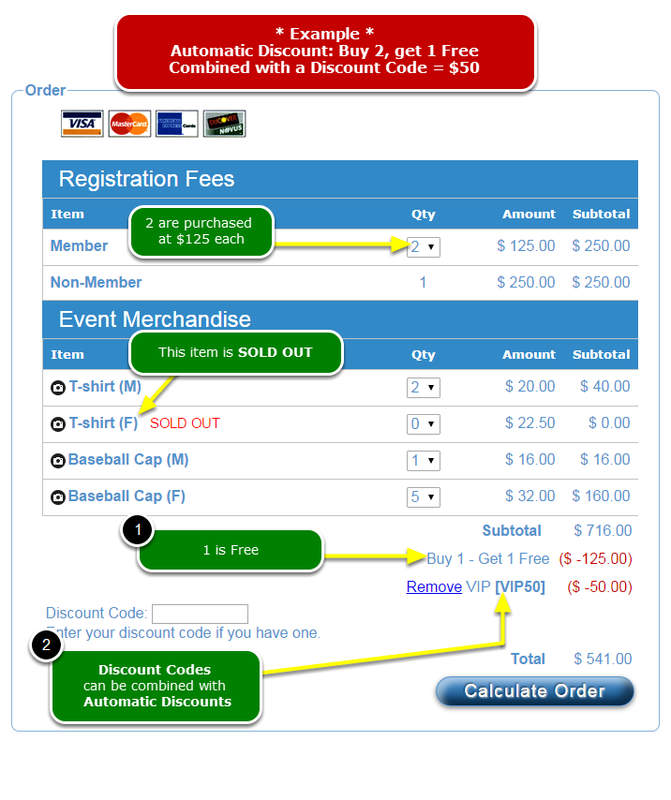 The charging of fees to participate in the event is perhaps the most common form of event revenue. 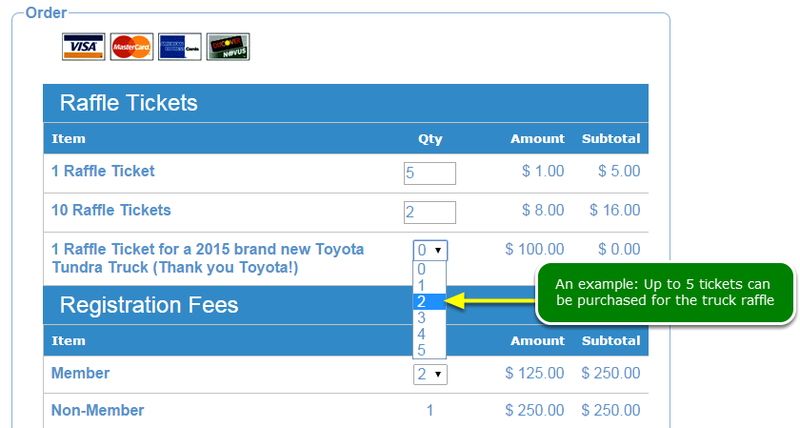 The example below illustrates 2 different discounts applied to the same order. Please see this article: How do I add tickets? It is common to find that some organizations employ "on-the-day-of" fund raising strategies. The most common example is the raffle, and a small amount of income can be achieved this way. Whereas it is difficult to achieve cash sponsorships, it is easier to obtain goods from sponsors which can be raffled. Some states recognize raffles as a gambling activity and therefore in opposition to the law (California is one). So check with your state officials whether or not raffles are legal in your state. Next: How do I set up Lead Retrieval options?